Property listings will be managed through the Listings tab within your website dashboard. 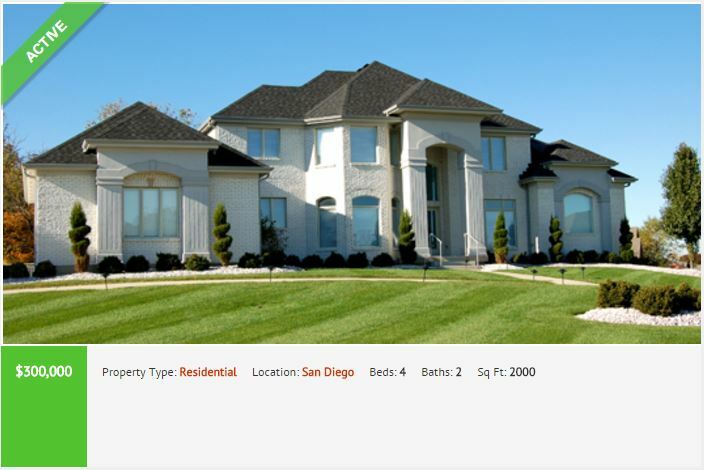 From here you can create listings, and categorize them by status, locations, and property types. You can also assign various features to properties that will work just like post tags. 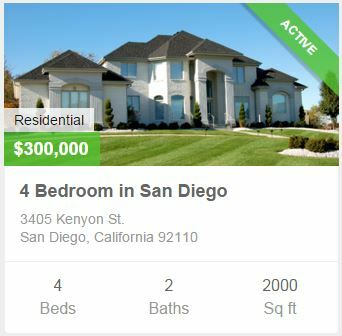 This will allow people to sort your listings by various criteria that is important to them. In this article, we will walk through creating a listing and then give an overview of how a listing will be displayed on your website. 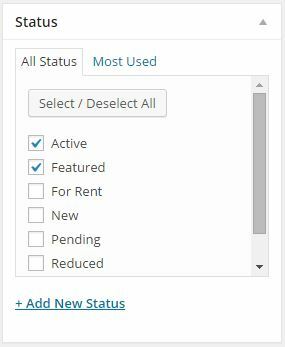 To create a new listing, you can click Add New under the main menu, or you can click Add New from the Listings page. For our example, we will start from the Listings Overview screen. The Listing Overview is very similar to the posts and page overview. Here you can see the main details of your listing. 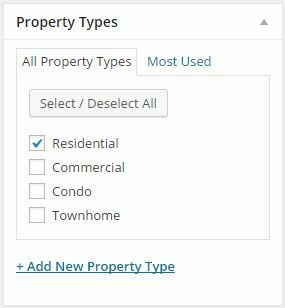 You can sort by various criteria such as property type or listing status. You can also search listings by typing in keywords in the search box. 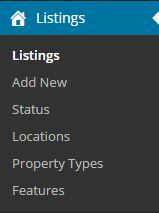 Clicking Edit will take you the listing to make changes to all aspects of the listing, while clicking Quick Edit will allow you to make limited changes to the listing directly from the overview screen. You may click Add New directly from the main menu or you can click Add New from the overview screen to create a new listing. Once on the Listing page, the first thing you will need to do is enter your listing title. In the first content section you will add a description of the listing. This should be a paragraph that gives a general overview of the property. Additional details will be provided in a list format in upcoming sections. Once your description has been added, the next section you will arrive at is Property Details. Here you can enter general property details such as address, number of bedrooms, and number of bathrooms. You do not have to complete each and every field for a listing. Only fields that are completed will be displayed. Below Property Details you will find Extended Details. Within this section there are more detailed fields to complete. The 6 fields you see below are only a few of many. You can view the full list when creating your listings. You can choose to hide the price of the listing if you would like to display an alternate message such as "Contact for Price." Custom Overlay Text can be added to listing previews. Below you will see "Custom Text" where this will appear. There will be a second editing box on the page which will allow you to add a photo gallery to the listing. To do so, click the Add Media button at the top of the editing box. On the following screen, be sure to click "Create Gallery" in the upper left corner. Once you have done so, simply click the images you want to add to the gallery and click "Create a new gallery" in the bottom right corner of the page. Your images will be inserted into the editing box as a single "gallery" which can be edited as a whole by clicking anywhere within the group of photos. A video tour or virtual tour can be added through an embed code as well. You will copy and paste your embed code into the below box. You can embed a map for each listing by either entering latitude and longitude, or by using an embed code. We recommend using Google Embed codes. Please see this Google Support Article on adding an embed code. Once you have followed these few short steps, you will paste the embed code into the box below where you see the Iframe code. 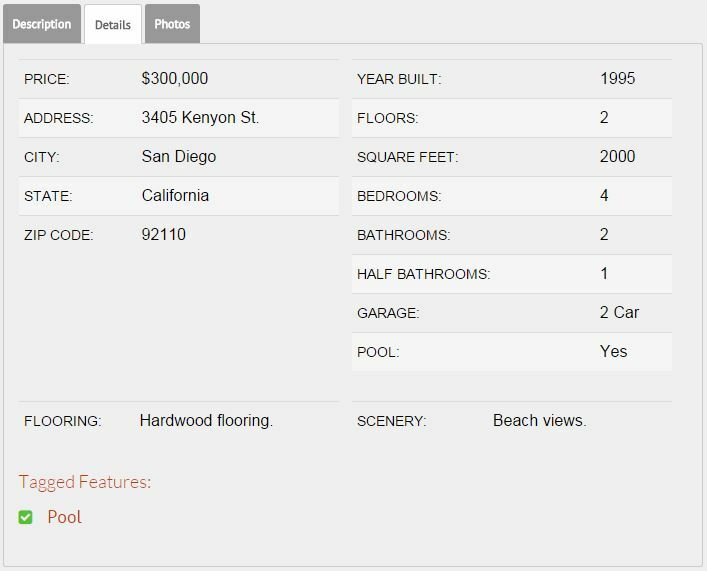 Under the Additional Details section you can add more information on the listing such as a Kitchen Summary, or School and Neighborhood Info. Below are a few of the fields, but you will see more when you create a listing. 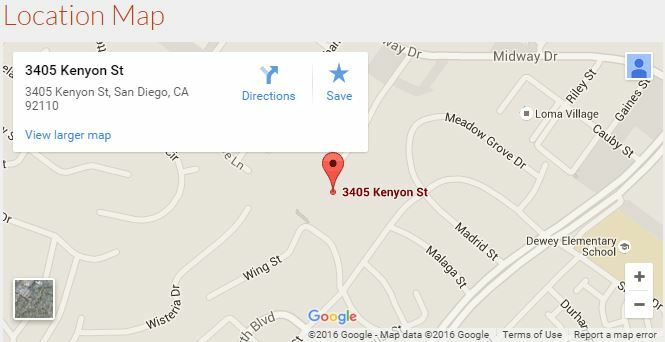 Listings can be organized by Status, Property Type, and Location. These behave the same as post categories. A property can be assigned to multiple categories and any number of categories can be created under each. 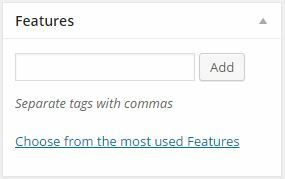 You can also add property features which behave the same as post tags. 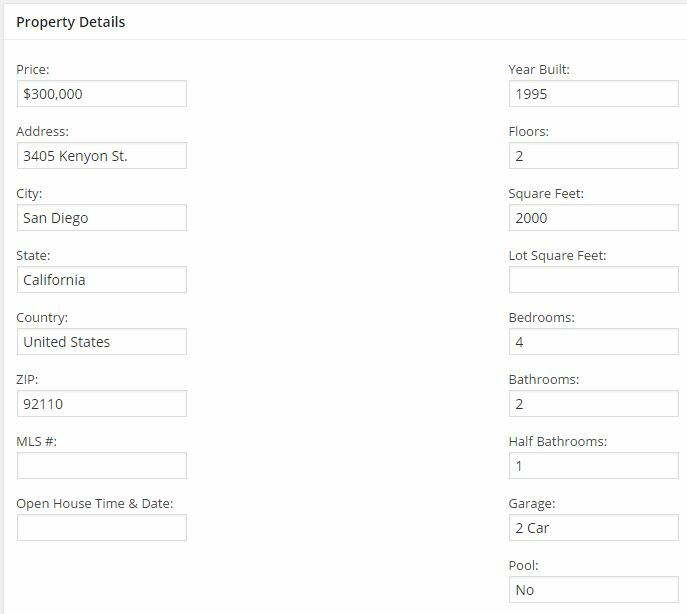 Feature tags will display under the details of section of your listing. 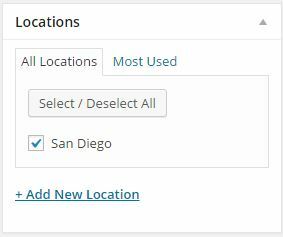 They will be clickable links which will take you to all other listings with the same tags. 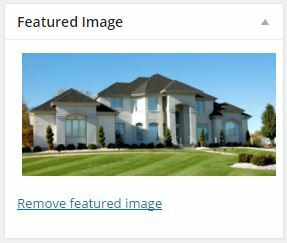 Featured Images are used as the preview image for a listing. Be sure to add a Featured Image to each listing you create. 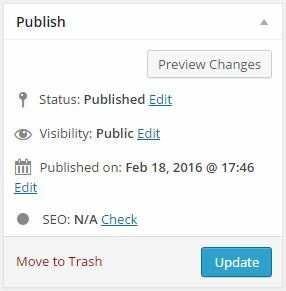 Once you have added your listing information, you can publish the listing from the Publish section. If you are making changes to an existing listing, you will click Update. Listings can have a status of Published, Draft, or Pending Review. Only Published listings can be seen on the site. You can also set the visibility of the listing to Public, Password Protected, or Private to control visibility of Published listings. Public listings are visible to everyone, Password Protected are only available to those with a password unique to that listing, and Private listings can only be viewed by site administrators. Below are screenshots of how our listing will appear. Once you click on a listing you will be taken to the listing's full page. Here you will see a larger image, and the remaining details. Your description, details, and photos will be displayed on their own tabs. You can see your Features Tags at the bottom of the details page. Below the 3 main tabs you will see the embedded map.